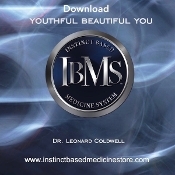 IBMS™ Youthful, Beautiful You CD Youthful, Beautiful You. A woman's Pick me up remedy when you are rundown. We recommend that customers begin by listening to the IBMS™ Stress Reduction Package or Quiet Time- Stress Reduction For Christians, a 21- day program. After mastering the basics, try one of our 11 IBMS™ cds.